Employers and occupational health professionals need to move beyond defining absence as either short- or long-term and describe workers who are off sick for between six and 19 days as medium-term absent, a leading health insurer has recommended. The proposal by AXA PPP healthcare was made as part of a consultation process being carried out by the National Institute for Clinical Excellence, which is drawing up new guidance on managing long-term sickness absence and incapacity for work. In its submission, AXA has argued that the definition of absence needs to be changed if employers are to improve how and when they intervene. Short-term absence should be set as absence up to five working days rather than, as is common now, any absence of less than than 20 days. After this there should be a new category of medium-term absence, of between six to 19 working days. Finally, long-term absence would be absence of more than 19 days. Thinking of absence in this way would result in employers changing how they respond to workers taking time off, it argued. The majority of short-term absence could be, if not ignored, then at least thought of as self-limiting and requiring no intervention, unless it involved repeated absence, as most workers would return by themselves. When absence became medium term it would lead to a simple low-cost assessment, at which point an employer could first identify, often as a result much earlier, whether there was a risk of it developing into long-term absence. 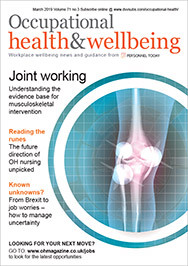 Most of the rehabilitation and intervention resources could then be targeted at long-term absence, argued Dudley Lusted, head of healthcare development at AXA PPP. “To continue to define short-term absence as less than 20 days may, unwittingly, discourage employers from earlier identification of potentially long-term absences – before they deteriorate,” he said. Yet, conversely, the desire to identify potentially long-term absences at too early a stage (for instance in the first week of absence) often led to inappropriate assessments that were a waste of resources. The consultation closed last month and the formal guidance is expected to be published in March next year. Nearly three-quarters of UK employees struggle in to work despite feeling so ill they could legitimately stay at home, according to a survey by AXA PPP. The poll found that, in the past six months, two thirds of workers had gone to work when they would have been within their rights to stay at home. And during this time, more than half had not taken a single day off sick. The main reason for doing this was loyalty – with workers not wanting to let colleagues down. But there was also a fear factor, with a quarter saying they had too much work to do to take any time off and 15% of respondents worried that taking sick leave could be used against them by their employer if redundancies were on the cards. One in five said they had used up some of their annual leave entitlement to cover having time off sick, something identified by Lancashire Police Federation to Occupational Health’s sister title Personnel Today last month. Dudley Lusted, head of healthcare development at AXA PPP, said the survey showed that being too zealous in monitoring short-term absence could backfire, as most employees were more likely to stagger in than skive off. “Smart employers will ensure their managers are properly trained and supported to manage attendance positively and, when people are off work sick, concentrate on managing those employees whose attendance should give genuine cause for concern,” he added.